The End Begins Here! Thanos, the Mad Titan, he who is in love with Death (literally, not figuratively) has gained control of the Infinity Gems. When these items are used together, the user can control every aspect of the universe! How did this madman gain control of something so powerful? That is the question, now isn’t it? Let’s take a look at, not only a universe shattering event in the Marvel Universe, but one hell of an epic for us comic fans to read. This month’s Crossover Classic brings to you Infinity Gauntlet! I think it’s safe to say that by now, nearly everybody that’s reading this has seen the Avengers, or even Thor, for that matter. If you’ll remember in Thor, we got a nice little hint of Thanos’ gauntlet in the chamber where Odin keeps some pretty cool stuff (did anyone else see the Eye of Agamotto?). That was it, until at the very end of the Avengers, we see just who is behind the invasion of Earth. None other than Thanos! To dive into that a little more, did you notice that his right hand was gloveless? 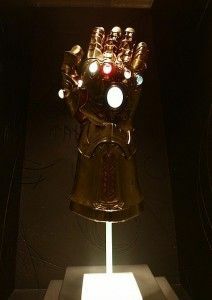 That’s just speculation on my part, but I think it’s a safe bet to say that the Infinity Gauntlet will fit quite nicely there. With these two pieces now established in the Marvel Cinematic Universe, rumors are flying that the Infinity Gauntlet is going to be the next storyline in Avengers 2. 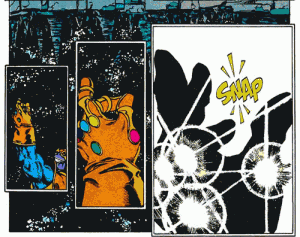 To help get you up to speed, let’s take a look at what exactly the story of the Infinity Gauntlet was, and just how much of an impact it had, not only on the characters and the universe it took part in, but also it’s impact on comics as a whole. It’s a quiet evening at the home of Dr. Strange, Master of the Mystic Arts. He hopes the rest of the night will stay as such. A hero in the Marvel Universe is lucky to get such a quiet night. Alas, it’s not meant to be, as a loud crash can be heard from an upstairs room. As Dr. Strange and Wong, his trusty assistant, rush to see just who is crazy enough to break in to his house, they discover that it is none other than, the Silver Surfer! The Surfer has come to warn Strange of a great danger, one that could bring forth the end of the Universe. That danger is Thanos. 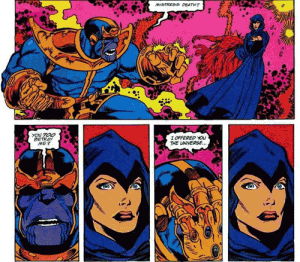 Thanos, just having acquired the Infinity Gems, now feels that he is an equal to his one true love: Death. With Mephisto in Thano’s ear, the Mad Titan returns to Death’s realm to show his love for her,but she’ll have none of it. With Thanos now in control of the Infinity Gems, he is her master now, and that is something Death cannot have. To Thanos though, he feels he’s done no wrong. He has only tried to show his love for Death in the only way he knows how! He has been devoted, feeding Death souls in his path that has been his life. Now, with the Infinity Gems, he can create the ultimate shrine for her, one that is fitting enough to belong to his mistress! That, however, is still not good enough. His love is worship! Death should be revered! But wait… wasn’t there something he had promised her? Was he not brought from the realm of the dead to perform on task for that which he loves so much? Yes… now he remembers. A lover should always follow through on a vow given. With Mephisto and Death watching, Thanos, the wielder of the Infinity Gauntlet, sets out to do what was commanded of him in the first place. To wipe out one half of the population of the Universe. Archangel, Black Panther, Daredevil, all of the Fantastic Four, Jean Grey, all of Alpha Flight (did we really miss them? I mean, C’mon.). The list goes on. Jim Starlin’s writing is nothing short of breath-taking. He is able to establish, over the course of 6 issues, just how flippin insane Thanos is. It’s unreal what he will do to not only prove his love for Death, but to get her to acknowledge him also. If you look at it, the heroes banding together to take on the Mad Titan is a futile gesture. They know there is nothing they can do to take on the wielder of the Infinity Gems. It’s really impossible. Thanos can control every aspect of reality, and he does. Jim Starlin writes Thanos in such a way that you really end up hating him right around the end of issue two. At first, maybe a small part of you is frustrated right along with him, but then, you become frustrated at him, and then altogether hating him. Starlin excels at that, and over the course of the series, you really can do nothing but sit back and watch as the greatest even in Marvel history unfolds before you. That’s really what it’s all about. The Infinity Gauntlet was the hottest thing for the last half of 1991. It had everybody in it! Spider-Man, Wolverine, Iron Man, Captain America, Doctor Strange, the Silver Surfer. Holy Smokes! With Starlin’s script, and George Perez’s artwork (Ron Lim took over halfway through issue 4) it made for one awe inspiring story. George Perez’s work was so seamless, and Ron Lim’s ability to maintain and keep the style that Perez laid down, that visually, it’s one of the best to come out of the ’90’s. Infinity Gauntlet was so involved in the Marvel Universe, that every existing title at that time had a tie-in issue. It brought about the return of Adam Warlock, who had bested Thanos previously, and set the groundwork for Warlock and the Infinity Watch, a series that would hold true through the other two parts of the Infinity Trilogy; Infinity War and Infinity Crusade. Now, we all know Thanos was defeated. That stands as fact. What came out of this though was just how much it pushed Thanos to the top of the villains list. Before, he wasn’t much. We’d see him in Iron Man from time to time (first appearance, anyone?) or Silver Surfer or Quasar would duke it out with him for a while. Not until the Infinity Gauntlet had Thanos really been let loose. Jim Starlin took the Mad Titan to an entirely new level in the series. As you read, you really are led to believe that Thanos can, and will, do anything that pleases him, or that could potentially please Death. In the wake of the Avengers film, people are starting to go Thanos crazy. Who’d have thought? It’s only logical, at least to me, that the Infinity Gauntlet storyline get a taste at the big screen, and with ol’ Purple Chin showing his mug at the end of Avengers, it seems Marvel feels that way too. 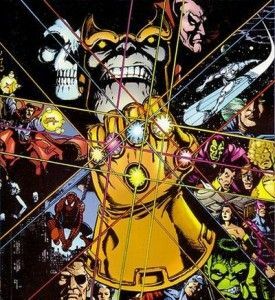 If you’ve never read anything with Thanos in it, and want to start, well here it is. This is the best place to get a taste of just what the Mad Titan is really capable of, and also to see just how small and useless all of our favorite heroes really can be when placed in a situation that they have no possible way of overcoming. They do though, you know, but you’ll have to read it to find out how. Is that really why you want to read it though? Heck no! We want Thanos! The Mad Titan! The one who controls the Infinity Gems! Well then, what are you waiting for? Get ‘em before the price is super inflated and you can’t afford them anymore! Go on, go! Tim Morse is a reviewer, podcast host, and Public Relations Manager for SMC. He also bows before almighty Thanos, but only when he’s in control of the Infinity Gems. He’s also the voice of SMC’s twitter, which you can follow here: @stashmycomics, but only because Thanos allows it. Just pulled this series out to read, it is one of my favorites! Does anyone know why Perez left midway through the series? I like Ron Lim’s work it is just disappointing the same creative team couldn’t stay with the whole series. A true classic, especially the scene with Captain America standing up to Thanos after all the other heroes have fallen, despite knowing he had no chance. Subsequent crossovers in the last 20 years have not lived up to this.